One of the most fascinating aspects of figure skating is its rich and complex history, layered with stories of triumph against diversity, personal sacrifice, judging scandals and record breaking "firsts". I am and always have been a huge believer that every skater, judge, coach and fan that has ever become involved in the sport has added something to its history that can never be taken away. It's all part of an intricate web. Earlier this month I spent an afternoon in a library with a microfilm scanner, a stack of dusty reference books and a mission: to tell the stories of the Olympic gold medallists in figure skating that we know little about. I started with a short list but ending up compiling more information about other Olympic Gold Medallists as well. In my May 9 blog article, "The Other Olympic Gold Medallists", I shared the story of 6.0 Olympic Gold Medallists we as the mainsteam masses may not know a lot about. I decided to continue this research and share the stories of another 6.0 figure skaters who won Olympic gold. From jail sentences to pistol shooting to winning an Olympic gold medal while pregnant, this group has it all! It's hard to believe the story of an Olympic gold medallist once revered by rinkrats could take such a horrific and dramatic twist but Wolfgang Schwarz's story has. After finishing 2nd to his Austrian teammate Emmerich Danzer at the World Championships in 1966 and 1967, Vienna's Wolfgang Schwarz put it together when it counted and won the Olympic gold medal at the 1968 Winter Olympic Games in Grenoble, France ahead of American Tim Wood and France's Patrick Pera, who also won Olympic bronze four years later in Japan. After his Olympic win, Schwarz turned professional and toured with Ice Capades and Holiday On Ice. In 2002, Schwarz was making headlines decades after his Olympic win, but these were certainly not headlines of celebration. Accused of plotting to kidnap the daughter of a wealthy Romanian businessman and of trafficking eastern European women for prostitution in Austria, Schwarz first denied then confessed to his actions in court and is currently serving his prison term. In his court admission, Schwarz admitted he was motivated by money and stated "I admit it was my idea to kidnap the woman. I cannot explain it," After a delay in his sentencing due to treatment for skin cancer, he was sentenced to an 8 year term in 2006. He has bigger worries these days than dropping to the ice on a double axel. His main worry is not dropping the soap. Born in 1874, Nikolay Aleksandrovich Panin-Kolomenkin was not only Russia's first Olympic champion but a jack of all trades. In winning the first and only 'Special Figures' competition held at the 1908 Summer Olympics in London, England, the athletic Russian not only excelled at figure skating, but was an accomplished shooter as well, competing in the 1912 Summer Olympic Games in Stockholm, Sweden and finishing 8th in the 50 meter pistol competition. He was also an avid rower, cyclist, gymnast and track and field athlete. His career was remarkably unique in that he was a well known and respected skating coach both before and after his win at the Olympics, defying the terms of "professional skating" today, where coaches are grouped with professional athletes. 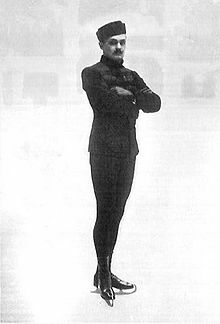 Panin-Kolomenkin was definitely a figures specialist as opposed to a strong free skater, and did not place in the men's figure skating competition at those same 1908 Summer Olympics, which comprised of compulsory figures and free skating. 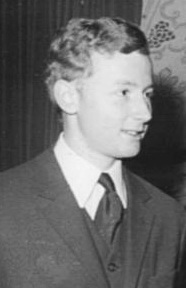 With his Olympic gold medal and medals at the Russian, European and World Championships to his credit, Nikolay retired from athletics and focused on writing several biographical and reference books, continuing to coach and judging international competitions until his death in Leningrad in 1956, at the age of eight three. The daughter of French music producer Edouard Mauroy, Magda Julin was born in France and moved to Sweden with her family when she was 7 years old. What's very fascinating about her career and many of the skaters of her time was her lack of international experience, owing to the difficulties of traveling worldwide to major competitions at the time. Available records show that Julin competed in many Nordic figure skating events during her era, but only competed at one World Championships, in 1913, some seven years before her trip to the 1920 Summer Olympics where she won the ladies figure skating event while pregnant (!) over Sweden's Svea Noren and America's Theresa Weld Blanchard. 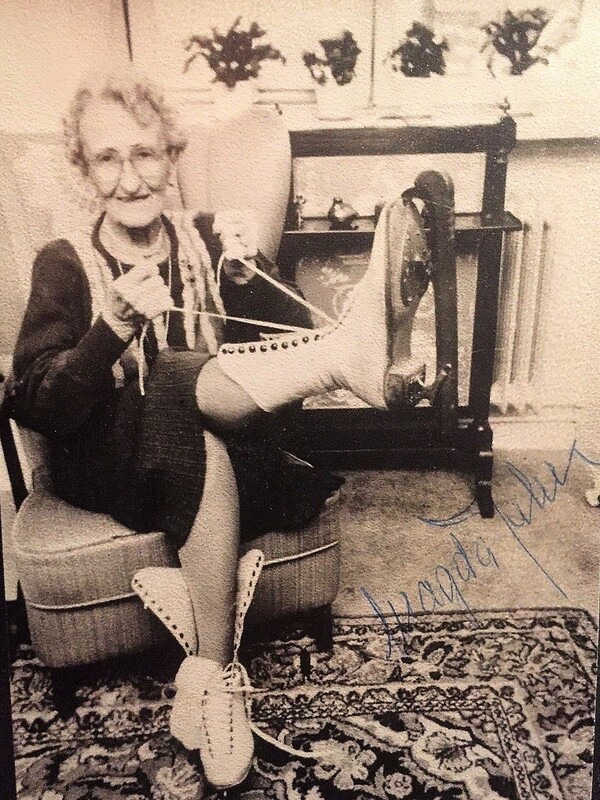 Julin, who was born in 1894 and lived until the age of ninety six, could be seen skating at the public outdoor ice rink in Kungsträdgården in central Stockholm at the age of ninety. If that's not love of the sport, I don't know what is. Julin had 2 sons and spent the last years of her life in an old age pensionare home in Stockholm. Before Katarina and Debi, Nancy and Tonya and Michelle and Tara, it was Annet Pötzsch and Linda Fratianne. They traded titles in the late seventies; Linda winning the world titles in 1977 and 1979 and Annet winning in 1978 and 1980. Both Annet and Linda were strong free skaters, but the catch was that Linda never finished lower than Annet in either the short program or free skate; her compulsory figures scores were always far back behind enough to ensure Annet the victory. When the rivals met in Lake Placid in 1980, Annet took a commanding lead in compulsory figures ahead of West Germany's Dagmar Lurz and Linda Fratianne. Although Linda won the short program with a very strong performance, Annet assured her win by losing in free skating not to Linda but to Switzerland's Denise Biellmann, who won the free skate with the performance of the night but had been considerably behind in compulsory figures. 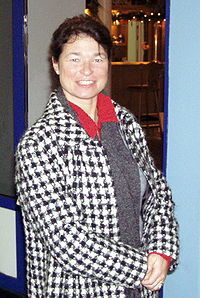 Although she was extremely well known in her day for her healthy rivalry with Linda Fratianne, Annet Pötzsch took a different road with her life following her 1980 Olympic win than most and did not seriously return to skating in the 1990's to pursue the many opportunities available for professional figure skaters of the time. She did however skate in the "Skates Of Gold" shows of 1993-1995, even landing double axels after years away from regular performance. 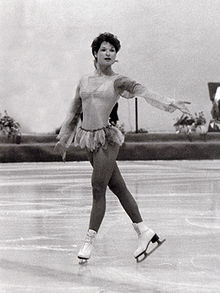 She was coached throughout her career by Brigitte Schellhorn, Gabriele Seyfert and later Seyfert's mother Frau Jutta Müller (well known to skating fans as Jan Hoffmann and Katarina Witt's dedicated coach). Annet was a well rounded, athletic skater who competed in 8 World Championships, winning the 1978 and 1980 World titles in addition to her 1980 Olympic gold medal. Retiring in 1981, Potszch was actually reinstated by the ISU in 1994 alongside many other professional skaters, but did not ultimately return to competition like her former training mate Witt. She opted not to judge as originally planned or skate herself and instead focused on coaching. She admittedly missed skating. Her connection to Witt was even more intense than the fact they shared a coach - she married Katarina's brother Axel, but they divorced in 1990. 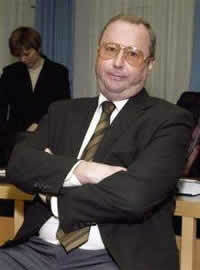 Their daughter Claudia Rauschenbach is a former partner of Robin Szolkowy. She is currently married to former German champion and Olympian Axel Rauschenbach and is the mother of 2 and a figure skating coach in Chemnitz, Germany, as well as an ISU technical specialist. 1956 European, World and Olympic Champions Elisabeth "Sissy" Schwarz and Kurt Oppelt hailed from Austria and were rivals of 2 time World Champions Frances Dafoe and Norris Bowden of Canada during their skating career. 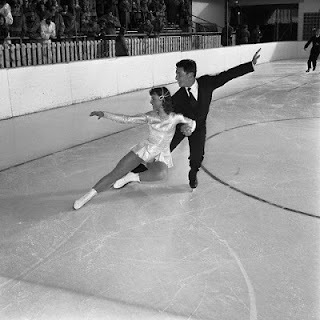 Schwarz and Oppelt were both no strangers to the Olympic Games, having competed and placed 19th and 11th respectively at the 1952 Winter Olympics as a singles skaters before focusing their attentions on pairs skating. With a performance in Italy at the 1956 Games to "Banditenstreiche" by Franz von Suppe, they narrowly defeated the reigning World Champions who faltered late in their performance to claim Olympic gold and their respective place in the history books. There was some hoopla at the time of their win, as the audience and journalists of the time both felt Dafoe and Bowden should have won despite their mistake. Schwarz and Oppelt had in actuality won on a majority of 2nd place ordinals. Following the Olympics, both teams met again at the World Championships in Garmisch-Partenkirchen, West Germany, where Norris and Bowden arrived to issues with their room reservations and had their music repeatedly interrupted. Without a coach or a team leader, they were left to face the tactics on their own. Schwarz and Oppelt again skated well at Worlds, but Norris and Bowden gave a much stronger performance, and when Schwarz and Oppelt were again named the victors, the audience pelted the judges with oranges and anything else at arm's length. Following their Olympic and Worlds wins, Schwarz and Oppelt turned professional and skated in shows in both Europe and North America. 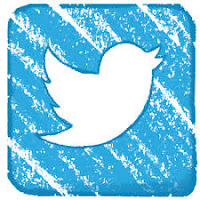 Sadly, Kurt Oppelt passed away September 16, 2015 in Orlando, Florida. Schwarz resides in Austria. Helene Jaroschka (then Engelmann) and Alfred Berger were another Austrian pair team who rose to prominence in early pairs skating and claimed an Olympic gold medal at the 1924 Winter Olympic Games in Chamonix, France. 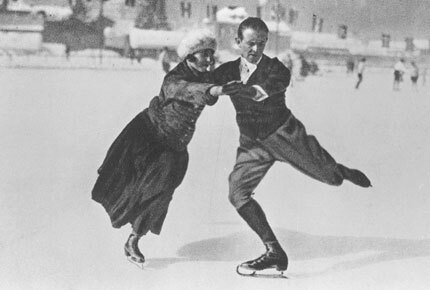 Engelmann was the daughter of Eduard Englemann Jr., a three time European Figure Skating Champion (1892 to 1894) who had a rink named after him in Vienna and was therefore exposed to the sport early in life. She won the 1913 World title with Karl Mejstrik at age 15 then teamed up with Alfred Berger and won the World title with in 1922, a success she duplicated in 1924 following the Winter Olympic win. Berger passed away in 1966 at the age of 71 and the younger Engelmann passed away in Vienna (where she was born) in 1985. They were certainly pioneers of pairs skating as we know it today and one of the many teams that helped shape the history and standard of pairs skating as we know it. Midori Ito And Why Adult Skating Makes Me Smile!